The polls are still more than a month away. It seems to me this is an important contest, likely to have significant influence on the direction of European policy. According to this Haaretz article,m the Socialist candidate, Ségolène Royal, is about as popular with the Zionist lobby as Anna Lindh in her heyday. Sarkozy, by contrast, seems to be the favoured candidate of the Israel lobby, with 'The Third Man', François Bayrou, also deemed a reliable ally. Now Le Pen is finally n the race too. My observations have been restricted to English-language media, but from that vanatge point at least, it certainly seems Royal's campaign has been lampooned in the press. It would be interesting to hear from French members of the forum on this election - in particular to gain impressions of the French media's campaign coverage. Sarkozy to exit, stage right, after first round? The report says: "A recent poll announced that over 50 percent claimed they were afraid of Sarkozy. " I think that's a very insightful question to ask in opinion polls. Here's a new population policy for Britain. with political spin-offs. Poll all Britons about whether they are absolutely terrified by Tony (what will he get us into next?) Blair! Those who say no should be press-ganged and dispatched to Iraq or Afghanistan, or encouraged to take boating excursions in Iranian waters. Some in France and the U.K. predict that the center-right leader of the French presidential election, Nicolas Sarkozy, will not be in the second round. In fact, the French electorate is very volatile. Indeed, it is so unpredictable that Sarkozy’s leading position in the polls could turn into his sharpest defeat on May 6. In 2002, for the first time in the history of the Fifth Republic, a leader of the far right surged to reach the second round. Actually, Jean-Marie Le Pen trounced Lionel Jospin, the socialist candidate who was left for dead politically. This was the greatest political upset for nearly 30 years. The young people who had seen this smashing defeat are now able to vote and they are widely motivated. All parties of the political spectrum have built sophisticated organizations devoted to rallying young people to their policies. However, the blogosphere is the space in which they work and gain new shares of the electorate to favor their respective candidates. So in this new space, we can observe in France a new phenomenon, the so-called "Miss Buzz" — a young woman named Quitterie Delmas who is widely known as the very symbol of the deepest hope of a new political generation. As the most popular personality of the Union for French Democracy Youth in Paris, she is widely seen from the right to the left as a new expression who could change the mood of the political debate, which might become more humane and enthusiastic too. Everybody in France knows that the presidential race could be decided finally in the blogosphere debate and by means of constant buzzing and activism, which leads to massive votes. Thus, the next president should win by a few points, and probably with support coming from the whole blogosphere. On the other hand, Nicolas Sarkozy expresses some conservative points of view and he is busy courting the far-right electorate who usually fears the new technology. So the buzz of the Union for a Popular Movement sounds weak and seems unable to win more precious Internet space, unlike the UDF Youth, which gains cyberspace day by day. The Socialist contender, Segolene Royal, is very active in cyberspace, but on some frozen mood. She has launched a citizen media venture, "Desir d’Avenir," including many participative debates too. Unfortunately, this citizen media venture fails to surge in the political real debate and in the mainstream media. Thus the whole socialist cyberspace looks like a glossy cover magazine with the fixed picture of the distant and straight queen, Royal. This is not as attractive as the vivid expression of Delmas, who looks like the anti-Royal image and personality, to the UDF’s profit and probable victory. Actually, the next president can’t win without the youth votes, and the cyberspace votes. Although nobody could have foreseen his irresistible surge, some in cyberspace had predicted the rise of Francois Bayrou, who is now more than the "third man." Some say he is the second favorite with U.K. Bookmakers, as the "rebel" candidate who sounds like a direct appeal to the young. Furthermore, on the blogosphere we can see Bayrou breeding horses and driving his famous tractor — widely seen on TV — as a symbol of rebellion against the main medias, and against the "godfathers" of the conservative political theater, from the far-right to the left-of-left. However, Bayrou seems mostly attractive to the left’s and right’s volatile voters. Still, Sarkozy can’t count on more rightist votes because Le Pen and Philippe de Villiers (the second far-right contender) eat up the right-of-right slice of the electorate. In the second round, Royal will certainly gain the left-of-left votes. In fact, the two leading contenders are probably Royal and Bayrou. They could run in the second round race toward May 6. Some might say the buzzing blogosphere is a sort of bubbly vintage. Nevertheless, the three horses are on the same line and race in the polls is tight — the first great upset in the 2007 election. Many voters remain undecided. A recent poll announced that over 50 percent claimed they were afraid of Sarkozy. In the first round, probably, Le Pen will maintain his 15 percent core vote. So Sarkozy has many reasons to fear this first round of voting. It could turn into a new defeat ending his political campaign and rise. If the changing political landscape in France claims the scalp of Sarkozy, and results in the election of a candidate not supported by the US/Israel axis, it will be interesting to watch the US media marshall its immense but predictable resources at France. The 'cheese eating surrender monkeys' line will get a big run on the Fox network, I predict. It should prove very interesting as this may be the first election in which the internet becomes a major influence on the political process, at the expense of the mainstream media. A sign of things to come I hope. However, while I think Sarkozy was the initial choice of the Zionist lobby, they's probably find François Bayrou acceptable - and I suspect this accounts for his rise and rise (as Sarkozy's unpopularity became apparent). If Royal or Le Pen look like winning in the second round, I'd think they's be well advised to use food tasters, wear bullet-proof vests and look out for men with prickly umbrellas. The French Election 2007 blog is a usful English language reference about the coming election. The recently released Royal poster here is probably one reason her campaign is bouncing back. A lot of Frenchmen probably share my view that she's better looking than any of the other candidates. Seven years of pleesant viewing must count for something. Apparently a recent bout of riots is expected to give Sarkozy a bounce - see the Guardian's French riot boosts vote for right. If it were not for the entry of Le Pen, the cynic in me would predict that April will be a very riotous month in France. However, Sarkozy may have to beware playing the riot / fear & loathing / terror card too freely, lest it comes back to bite him. Le Pen interviewed by the Lebanese Press (emphases added). Not quite the lunatic racist monomaniac portrayed by the mainstream western mass media? On topics covered by this interview, he more faithfully embodies the original Gaullist tradition than Sarkozy. Le Pen's interest in genuine independence and justice for the Arab world is reminiscent of JFK. 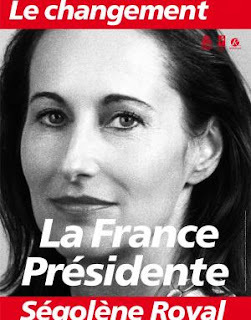 You are one of the principal candidates in the presidential election campaign in France. You have however a very controversial image, a fact which prevented you from winning the election of 2002. What are your chances this year? I am not a controversial person. It’s the media which have given me this image, and you know perfectly well why they’ve done this! I embody, for my part and myself alone, patriotic and national values in France. I am neither a xenophobe nor a racist, but a Francophile. I am the only French politician who dares to denounce the system and to propose radical solutions to the various problems from which France has been suffering for decades. Instead of just mouthing slogans, like most of the candidates, and enumerating the problems, I tackle in my program the real causes of the malaise in France and propose real and pragmatic solutions to resolve them. And as you know, I am a great friend of the Arab world, and of Lebanon in particular. In my political party and in decision-making bodies in particular, there are French people of Lebanese and Arab origin. My diplomatic advisor, Elie Hatem, attorney-at-law, is as you know a person of Lebanese origin. For my part, I have never missed any occasion to express my friendship and support for the Arab world and for Arab peoples, as you may see in my many statements and communiqués. I hope to create a big surprise in the coming day, for I think that my true face and my true, sincere and constant commitments to my country can no longer be hidden. But surely there are other candidates who defend these values and who are great friends of Lebanon, such as Philippe de Villiers, for instance. I don’t share your view at all. In the 1990s Mr. de Villiers expressed an apparent sympathy for and defense of Lebanon’s independence. Above all, he wanted to benefit from the media fallout of his visit to Lebanon in the company of Mr. Léotard in 1989. He went to support General Michel Aoun in Baabda Palace, exploiting the repercussions of this event in the French press. I stress to you that Mr. de Villiers is credited with the support of no more than one percent of those who intend to vote, according to opinion polls. Certain French people of Lebanese origin, even French people who are friends of Lebanon, have expressed their sympathy for Nicolas Sarkozy, even for Ségolène Royal, who visited Lebanon at the beginning of the election campaign last year. Or even for François Bayrou, who is rising in the opinion polls. In what way do you differ from these candidates? As you can plainly see, Ms. Royal lacks political experience in every respect, be it in domestic politics, in economic and fiscal matters or in international policy. Her visit to the Middle East bears witness to this. She also belongs to a political formation [the Socialist Party] which for many years governed France and which left its imprints on the French political scene. I remind you that one of Ms. Royal’s “elephants” of the Socialist Party is none other than Lionel Jospin, who has made disagreeable statements in regard to the Arab world, notably Lebanon and Palestine. The election of Ms. Royal to the Presidency of the Republic, with Mr. Lionel Jospin or even Mr. Strauss-Kahn (also very pro-Zionist) as prime minister would mark a radical and dangerous change in French foreign policy, notably in regard to the Middle East and the Arab world. Finally, I would point out to you that the French have still understood nothing of Ms. Royal’s program, which is an empty shell. The propulsion of Ségolène Royal into politics is the result of a media campaign like that around François Bayrou, who began this campaign with an original idea, certainly, but whose political program is non-existent. Mr. Bayrou proposes that if he is elected president, he will form a government of national unity. I see no reason to justify recourse to such a government, except in the case of a major crisis, such as what is now happening in Lebanon, for example. As for Nicolas Sarkozy, he presents a danger to France both in terms of internal politics and international policy. He has mastered the arts of demagogy in order to benefit from internal events like riots and insecurity… The degradation of the situation on this level is the result of the policy of the right as well as of the left, a policy which has permitted an uncontrolled and wild immigration to develop over the last few decades, at a time when France had no means of receiving such vast numbers of immigrants. Instead of trying to limit this plague and to integrate the newcomers into French life, the immigrants were deliberately placed in ghettos where they are manipulated and exploited as an electoral card, as much by Mr. Sarkozy as by politicians of the left. I can tell you that a large number of French people of foreign origin vote for me. As you know, I am the only French politician who has denounced the attitude in regard to the peoples of the Arab world, the way they are pushed into misery and disarray and therefore towards the adventure of migration, instead of giving them the opportunity to develop their own countries and societies! I may note here too that France does not at all possess the means of applying Mr. Sarkozy’s social and economic program, which is both utopian and demagogic. And in matters of foreign policy, the Atlanticism of Mr. Sarkozy, which he does not trouble to hide (he openly parades his support for the policy of the George Bush Administration), his desire to subject France even more to the arbitrary will of the European Union since he is committed to adopting a European constitutional treaty which was rejected by a popular referendum two years ago, his break with traditional French diplomacy, with its respect for the principles of international law – including his unconditional support for Israel – constitutes a danger on which French voters are called to reflect. Finally, it’s necessary to point out that Mr. Sarkozy belongs to the political establishment which has given proofs of itself and whose results we know. That’s why Mr. Sarkozy has taken over a very large part of my program and the ideas I’ve been urging for 30 years! Don’t you think that in voting for Nicolas Sarkozy, or in expressing an intention to vote for him, French people of Lebanese origin or the friends of France are showing their fidelity to Jacques Chirac, who supports him? Mr. Chirac was obliged to support Nicolas Sarkozy on March 21. He did it because he had no other choice. As you know, the French president waited until March 11 to announce that he did not intend to stand for a third term. He then waited 10 days, after that announcement, to express his unenthusiastic support for Mr. Sarkozy, who had, by means of various maneuvers, imposed himself as the sole candidate of the Union for a Popular Movement (UMP). I don’t think that Jacques Chirac truly supports the man he betrayed in 1995 and with whom he has had disagreements on the subject of opinions and methods, disagreements which have widened since the appointment of Mr. de Villepin as prime minister. We’ve seen the emergence of two factions within the UMP: one “Chiracquian”, the other “Sarkozist”. The second won out and Nicolas Sarkozy then presented himself as the “candidate of the rupture”. President Chirac shot this slogan down when he announced his support for Mr. Sarkozy, then the interior minister, on March 21, describing him as the “candidate of continuity”. Finally, it’s necessary to recall to French people of Lebanese origin and to the French who are friends of Lebanon, the constant and clear stances of Nicolas Sarkozy on the land of the cedars: while your country was being attacked by Israel last summer, Mr. Sarkozy was declaring himself to be a “friend of Israel”. He repeated this statement last February 28 to a meeting of Lebanese and friends of Lebanon in Paris some days after repeating it to the Arab diplomatic corps in France. I would point out to you that a close advisor to Mr. Sarkozy is Mr. Arno Klarsfeld, who took Israeli nationality at the age of 37, after which he enrolled in the frontier guards of the Israeli army. This friendship between Mr. Sarkozy and Israel was enshrined a few days ago by the issuance of a postage stamp in Israel bearing the effigy of Nicolas Sarkozy. What in fact is your own position in regard to Lebanon, but also to the wider Arab world, the Middle East in particular? As I have already stressed, I have always supported the independence and sovereignty of your country, in the spirit of fidelity to an ancient friendship linking our two nations. I have done it in difficult moments. I have denounced the occupation of Lebanon, whether by Israel or by Syria, in an unwavering and objective manner, not for personal reasons, as Jacques Chirac has done, sometimes tardily. I have also constantly called for a Lebanese-Syrian reconciliation and for a peaceful normalization in the region with respect for the independence and sovereignty of all the countries and peoples of that region. I was the first one in France to firmly condemn Israel’s flagrant aggression and invasion of Lebanon last July. Today, I am deeply pained to see your country afflicted by this plot aimed at destabilizing the Middle East and undermining the nationalist regimes that constitute a rampart against the emergence of fundamentalism and extremisms. Lebanon, an exemplary model of harmonious coexistence among several communities, is a paradigm of this. I hope to see the Lebanese of all tendencies and confessions live reconciled in peace, including with their neighbors. I am deeply troubled by the resurgence of tension in that country, which was pacified by international negotiations and which has been plunged again into violence. As I have just told you, I openly condemned the recent Israeli aggression and its baseless pretext (the abduction of two soldiers) to justify this operation of massive destruction of the whole Lebanese infrastructure, which has dealt a blow to the sovereignty of that country and to its economy, tourism and cultural outreach. The series of assassinations which occurred recently, the latest one being that of Pierre Gemayel, deeply pained me personally. But this has not prevented me from expressing all my caution in regard to designating those who may be responsible. All these crimes benefit the detractors of that region of the world. France must be the bearer of a message of peace for the whole of the Middle East and must work to be a catalyst for reconciliation among the various antagonists, without taking sides in the conflicts, safeguarding its historic links with Lebanon and with Syria (the Syrian Republic owes its modern origin to France). It is only through consensus and dialogue that problems can be resolved, not through provocations, outbidding or violence. In December 2002, during your visit to Lebanon accompanied by Elie Hatem, you expressed your fears concerning an American intervention in Iraq, and later you expressed opposition to this action, like most other French politicians. What is your present position in regard to this conflict, and what sets you off from the other candidates in the election on this matter? I have an excellent memory of that visit, during which I was warmly received by the Lebanese. I also received very sympathetic letters from the political and religious authorities. On that occasion, more precisely during my press conference at the headquarters of the Journalists’ Association, your own premises, I alerted international public opinion on the real intentions of Mr. Bush’s Administration: the general destabilization of the Middle East, its regression on the political, social, economic and cultural levels, the dislocation of national models so as to plunge the region into an imbroglio that would promote the emergence of fundamentalism and confessionalism and, in consequence, the creation of weak confessional and theocratic states and the strengthening of the American grip on the petroleum. I was the first French politician to unmask and condemn Bush’s real intentions: the objective of the American intervention in Iraq was the “Lebanization” of that country and the provoking of a civil and inter-communal war, not the destruction of the so-called prohibited weapons or the setting up of a democratic regime. With hindsight, you will see that my prediction has come to pass. Mr. Bush’s genocidal policy has succeeded in sowing trouble not only in Iraq but also throughout the region. Contrary to what is being said, the objective of George Bush has thus been achieved, and his operation has well and truly succeeded! What is your stand on the threat of a possible American – and even Western – strike against Iran? What is your position in regard to the Israeli-Palestinian conflict? I believe I am the only French politician to denounce the gradual extermination of the Palestinians. I see Israel’s construction of a wall of shame in the West Bank as a scandal. The Palestinian people have every right to reconquer their homeland and restore a state that respects the rights of all its citizens, regardless of their religious affiliation. In this respect I would remind you that the Palestinian resistance was for long led by Christians. I don’t understand why Hamas, which came to power by democratic means advocated by the West, should be marginalized or why the Palestinian people should be penalized for their democratic choices and dragged into a crushing economic and financial crisis that can only favor excesses and extremism. It is time the peoples of the Middle East were able to live in peace and prosperity, in mutual respect and tolerance. What message would you like to send to the Lebanese, to French people of Lebanese origin and to French people who are friends of Lebanon, at this crucial time in the history of the Fifth French Republic, on the occasion of these elections? As you stress, this election will be crucial for France. It will certainly have repercussions on Lebanon and the Middle East, to the extent that there are candidates who will be able to call into question France’s historic role in that region of the globe. I call on them to make the right choice, in order to safeguard the historic links uniting us. In many ways your most disturbing (and revealling) post so far. I'm not sure what you mean, John. Perhaps a response isn't needed. Nevertheless, I think it may, because I detect an insinuation that I have 'revealed' something 'disturbing' about my views by posting the Le Pen interview approvingly. Well, my interest is in calling it as I see it. The extracts I bolded from the Le Pen interview, IMO, indicate decency and fairness to the Arab and Muslim world - and in particular to Palestinians who have now been in exile or under occupation since almost as long as anyone can remember. That decency and fairness is sorely missing in mainstream political discourse these days. Most major western politicians have been intimidated into toning down their condemnation of Israeli apartheid and exhibit double-standards when responding to Israeli behaviour. I think de Gaulle - whatever his many faults - had a genuine interest in asserting French interests, even when it brought him into conflict with the Israelis who were keen on the continuation of French colonialism in north Africe. JFK showed the same willingness to stand up to aggressive hustling by the Israelis and their domestic lobby - as did Carter on his good days. The rest of the US Presidency has gradually tilted not so might rightwards as in the direction of Zion. Likewise most European nations. It has been in the interests of Zionists to portray Le Pen as beyond the pale. For all I know, he and his supporters may well have said silly things over the years. But what is offensive in the inteerview I quoted? Anything? Le Pen, as I understand it, has a restrictive approach to immigration. In that respect, he's probably in step with a majority of Europeans. Not me. I happen to have an unusual view that anyone on planet earth should be able to go wherever they please, as a birthright. When I quote an extract from someone's writings - or a speech they have made - it does not consititute absolute endorsement. I do not thereby stand behind their entire life work. It does not make me 'right-wing' if they are known to be right-wing, or vice versa. Having said all that, if I was French and faced with Sarkozy v Le Pen in the second round this year, I'd vote for Le Pen, based on what I know now of their repective policies. If saying that in this forum is like farting during High Mass, so be it. You have again exposed yourself as a Nazi supporter - where and when you fart is of no interest to us, but at least we all now have final confirmation of what you are. Incidentally your contributions from both ends are rather similar in terms of their value and worth. Are you saying that everyone who votes for Le Pen in the coming election is a Nazi? Just interested in seing where you draw the boundary of your opprobrium. Does a proud 'anti-Nazi' like you support banning Le Pen's Party? Would you advocate banning his participation in this election? How about incarcerating Le Pen and his supporters... or dropping large bombs on his headquarters? I ask, because I'd like to get a more complete picture of the respective policies of 'Nazis' and 'anti-Nazis'? It's my understanding, for instance, that 'Nazi' Le Pen supports free speech on all historical matters. It is reasonable to deduce that a man who consistently denies the holocaust, champions the cause of Nazis such as Zundel and Irving, invents fantastic Zionist conspiracy theories about just about every topic he can think of, and now openly supports the platform of French fascists is at the very least a "Nazi supporter." Your continued insistence that Nazis support free speech is ridiculous and not worthy of further comment. You may reflect if we give you a bit of time to think about it that you have been afforded free speech on this forum. You may also reflect that mature democracies do allow political participation from a broad spectrum of ideologies. The rest of your recent post is just nonsense. I'll respond to this point only, Andy. For the record, I never 'insisted' that "Nazis support free speech". But you, Andy, cannot have it both ways - not as long as there are people who refuse to be intimidated when your behaviour becomes unpleasant and authoritarian. Either you claim I am a 'Nazi' - and therefore admit that at least ONE 'Nazi' DOES support free speech - or you desist in branding me with this term. You will not find any material I have written anywhere - or statements I have made on any occasion - that argue against free speech. On that matter, I have been consistent all my adult life. Puerile, spiteful invective usually misses its intended target. I am not being unpleasant or authoritarian. I am merely responding to the very foul views you very consistently and very freely forward on this forum. France is often described as having a special relationship with the Arab world. Paris is widely seen as the Western advocate for Arab people. But that could change with election of a new president in May. Some people summarise the French Arab policy as being a "weapons for oil" policy. It is a simplistic representation, probably motivated by ill will toward France. According to this thesis, France supports Arab positions for commercial reasons, to have a better access to Arab markets. Another motivation would be the large Arab-Muslim minority living in France, estimated to be 5 million people out of a total population of 62 million. But the roots of any French pro-Arab positions stem less from electoral or commercial motivations and are primarily strategic. During the Fourth Republic, 1946 to 1958, many onlookers perceived France as anti-Arab. Since 1954, Paris had been at war with Algerian nationalists. In 1956, France, the UK and Israel together launched the Suez campaign to defeat the growing Arab nationalism threatening to nationalise the Suez Canal. During this time, France was Israel's closest ally, helping it acquire nuclear weapons. The 1967 Arab-Israeli war was a turning point for French-Arab relationships. Charles de Gaulle blamed the Israeli government for bearing the responsibility of the war. Despite strong internal opposition - the French strongly favoured Israel - he broke the privileged alliance between France and Israel, and predicted that the occupation of the Palestinian territories would bring new problems instead of solutions to the Israeli-Arab conflict. The French position on the Israeli-Palestinian conflict has been constant since 1967, during a time when neither Arab money nor Arab voters were important. After the 1973 war and the oil crisis, French-Arab relations underwent impressive development in both economic and strategic areas. Paris and Arab countries had complementary interests. A Western country and not part of the communist global alliance, France also had the advantage of a solid political independence with respect to the US, according to Arabs. But strategic motivations were more important. Development of relations with Arab countries was a way to reinforce breathing room from superpower influence for France. It was a way to project within the Arab world the traditional French diplomatic guidelines: promoting a French version of universal values and giving more leverage to French diplomacy by establishing strong links with developing countries. The election of Fran็ois Mitterrand as president in 1981 and 1988 caused worries in the Arab world. He was considered a strong friend of Israel, and some expected France to change policy and return to the pro-Israeli diplomacy of the Fourth Republic. Mitterrand did indeed take a strong position in favour of Israel's right to live in security within internationally recognised boundaries, but was also the first Western leader to declare support for Palestinian self-determination, a right to have their own state. Moreover, France saved Yasser Arafat's life in 1982, protecting him against Israel and Syria. In the 1990s, France strongly condemned the Iraqi invasion of Kuwait and took part in the war, only after Saddam Hussein refused all proposals of mediations or peaceful solutions and passage of a UN Security Council resolution. In 2003, as the US prepared to invade Iraq once again, France was a leader of the anti-war movement, although its goal was not to protect Saddam and his regime. Jacques Chirac thought that launching a war at that moment, without clear evidence of weapons of mass destruction, without any link between Saddam and al-Qaeda and without progress in the Israeli-Palestinian conflict, could only fuel antagonism between the Muslim and the Western worlds and instead turn out to be a gift for al-Qaeda. French policy toward the Arab world is a classical approach combining national interests, strategic perceptions and debate on values. A permanent member of the UN Security Council, France has strong interest in promoting the UN and international law. France's own experience with an unwinnable war, after Algeria sought independence in 1954, has led it to regard military occupation as a dead end. French leaders have long understood that the Palestinian cause resonates in the Arab and Muslim worlds, and that Paris has a special role to play in the Arab world due to its independence with respect to Washington. As the French presidential election approaches, there is still no open and clear debate on international policy and the future of French policy in the Middle East. The topic is hardly perceived as minor. There is a large consensus that the Israeli-Palestinian conflict is a major issue in international security and that France's international prestige is at stake in this area. It is true that a part of the Jewish community, estimated at 600,000 people, increasingly consider candidates' attitudes toward Israel as a main criterion of their vote. Likewise, the Palestinian issue could influence a part of the Muslim vote. Muslims link their own social difficulties with the fate of the Palestinians. Though Muslims far outnumber Jews in France, their social and political weight is minimal. Unlike the attitude in 1967, the majority of French people, regardless of origin, tend to place blame for the ongoing conflict on Israel rather than the Palestinians. Yet political leaders in France resist outspoken criticism of Israel, out of fear of being labelled anti-Semitic. Many who are highly critical of Israel in private conversations prefer to be lenient and apologetic in public. The centrist candidate Fran็ois Bayrou has expressed little consideration for the Palestinian fate and has thrown his support to Israel, though he recognises the legitimacy of Palestinian aspiration to achieve statehood. Fault lines for this issue are drawn not between but within the two main parties, the right-wing UMP and the Socialist Party. Inside each, there are so-called pro-Palestinian and pro-Israeli supporters. S้gol่ne Royal, the Socialist candidate, went to the Middle East to acquire an international stature, but with mixed results: critical of Israel while in Beirut and understanding while in Jerusalem, she disappointed the pro-Palestinian segment of her party. In the end, she constantly refers to international law, a message viewed as favourable to Palestinian arguments. On the other side, Nicolas Sarkozy is largely considered as pro-Israel. He visited Israel several times, but never the Palestinian territories. He blamed Hezbollah for the Israeli-Lebanese war, though he qualified that by describing the Israeli reaction as disproportionate. Nevertheless, Sarkozy is popular in Israel, unlike Chirac. With Royal's popularity sinking and the rising fortune of pro-Israel Bayrou and Sarkozy, French policy toward the Middle East may be reaching a crossroads. Forty years after de Gaulle's strategic move regarding the Middle East, the world could witness a reorientation of the French international policy. Pascal Boniface is director of the Iris Institute for International and Strategic Relations. He has published or edited more than 40 books on French foreign policy, nuclear affairs and other strategic issues.